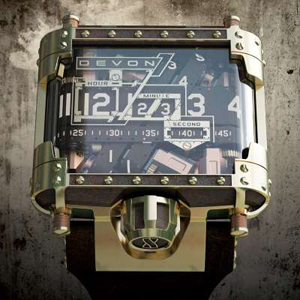 Devon Works – American watch company whose name is associated with the development and production of innovative watches that his bold and powerful design, and technical solutions have surpassed the human imagination. Founded by designer Devon Scott brand has released its first model in conjunction with the California aerospace company. 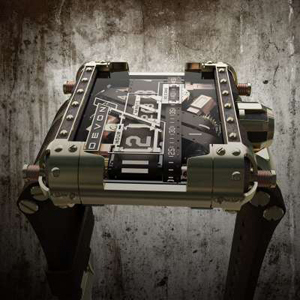 Today, Devon Works presents its new model – Tread 1 Steampunk, which by its appearance similar to the previous. As the name implies, it is clear that the exclusive novelty is executed in style, steam-punk. To give the novelty spirit steam-punk, watchmakers have given a massive body size 56x50x18, 5 mm bronze shimmer. Compared with the previous model, the new model is also unusual method of indexing time. Instead of arrows selected tape, which displays hours, minutes and seconds. Has retained its place as a rather large crown at position 6:00. With body color harmonizes brown belt watch of fiberglass reinforced nylon. Model Tread 1 Steampunk from Devon Works will be an inseparable part of your collection, because wearing them every day is probably not that good, judging by the size of the housing.